1. Minimizing soil tillage to preserve soil cover, organic matter, structural organization and the biological activity of arable soils; 2. Maximizing soil vegetal cover to protect the soil against climatic aggressions, to recycle and to produce nutrients, to feed soil and surface biological activity, to develop deep and organised structure; 3. Improve crop rotation, to reduce weeds and predators and also to increase biodiversity in order to enhance soil fertility through reduction in pesticide use. There is no one way to practice Conservation Agriculture: each farmer has to adapt soil tillage, covercrop and rotation to his own system. All the experience related to these farming practices gathered since 1930s has shown that there is paractically no limit of CA systems, regardless of the soil, climate or crops. Today, even if it is only practised on 5% of cultivated soils, Conservation Agriculture represents a quickly growing type of agriculture and currently covers about 90 million hectares in the world. Most of the direct drilled surfaces are in the Americas: about 20% of arable land in the US is cultivated without any tillage (and 50% with minimum tillage), 50% in Argentina or Brazil. In Europe, due to the growing cost of energy and inputs, farmers are now following the same way without much support of research, governmental or private structures. Minimizing soil tillage leads to soil improvement and then to inputs reduction In agriculture, the only way to improve production in terms of both quality and quantity is to conserve or to improve soil fertility. Good soil structure and permanent cover allow the reduction of mechanisation, fuel consumption and irrigation. Good soil fertility can reduce the need of fertilisers; healthy soil life means less pesticide use. Conservation Agriculture is an effective way to ensure soil protection and fertility and therefore to reduce inputs without compromising yields, or even achieving better production level. direct energy used on the farm5, out of which 52% used for mineral nitrogen production (one litre of equivalent oil is needed to produce one kilogramme of ammonium). The remaining 40% are used by farm machinery and other farming operations such as irrigation, drying… Today, with the increasing cost of fossil energies, i.a. due to increased demand from China and India and also forecasts of the future peak oil, the cost of agricultural production is growing fast in a long term. At the same time, it seems that human population will not stabilize until the end of the century and according to the Food and Agriculture Organization estimates production needs to be multiplied by 3 to feed the expected human population of 9 to 10 billion in 2100. Moreover, in a context of arable land degradation6, urbanisation, depletion of biodiversity, climate change and reduction of water resources we have to preserve our various agroecosystems. Input reduction needs organic carbon After several years of no-till system soils achieve higher fertility, become able to structure naturally and allow the development of soil life. In fact, it is possible to reduce the part of fossil energy if the “life’s energy” took over. For example, soil biological activity may replace soil tillage in favourable conditions, supporting various functions of the soil, such as crop protection, pests and disease management. This complex soil ecosystem needs energy to work: organic carbon from photosynthesis is the fuel for the soil7. For that reason, high efficiency farming systems need to preserve, create and recycle a lot of organic matter. In that way, no tillage reduces the injection of heat and oxygen in the top soil layer, reducing mineralization of organic matter by bacteria and fungi. Moreover, the reduction of the period between harvesting and seeding allows to grow more biomass (crop, cashcrop or covercrop) per hectare and per year. Water management in Conservation Agriculture Intensive and deep tillage, practiced in our farming systems for thirty years, quickly degrades the soil surface and structure (picture on the right – after 4 years) and consumes organic matter. Repeated tillage, heavy traffic on the field and the lack of organic matter and bioactivity lead to a horizontal layering of the soil. During the cool season the rainfall infiltration is reduced and bare soil is exposed to erosion and run-off: the water is not stored in the soil and pollution problems occur (nutrient and pesticide leaching, mudslides and increase of flood risk). Other production problems occur during the growing season: drought risks with bad water storage during the winter and poor capillarity, and/or weak roots colonization in the soil profile. Conversely, no tillage preserves the natural cover on the soil surface and the vertical organisation of the profile due to roots, earthworms and biological activity in general. Rainfall does not destroy the surface, better infiltration and the reduction of crusting, run-off and erosion is achieved. The soil is capable to store water quickly during the winter and to release it during growing season; soil particles, pesticides and nutrients remain on the field: the farmer saves inputs, avoids pollutions and reduces flood risks. No tillage and pesticides uses There is a strong link between no tillage and herbicides. In the 30’s in USA, soils were ruined during the “dust bowl” due to intensive tillage; Nebraska’s department of agriculture found that soils need a cover to prevent erosion: reduction of soil tillage, maintaining crop residues on the surface could preserve soils. The difficulty, however, was connected with weed management. In European countries inversion tillage was essentially used to control weeds and also to fertilise crops by activating the mineralization of organic matter: no tillage frequently led to weed Infestations. In the 70’s the launch of new herbicides, such as Paraquat and then Glyphosate, allowed chemical weed control without any tillage. The possibility of cleaning up the field simply with chemicals helped to overcome weed management problems and to increase quickly no-till and minimum tillage area in the world. At the same time the development of intensive agriculture in South America, and therefore ploughing, led to the quick destruction of arable land due to the hot and wet climate. Brazilian pioneers developed direct drilling on dead or alive vegetation. Those techniques were supported by chemical companies such as Monsanto, Syngenta, BASF and others. 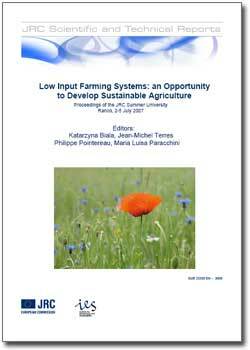 Classical intensive farming systems and agronomy. With the development of modern farming systems, including development of crop genetic resources, machinery and agricultural chemicals, farmers don’t need to apply basic agronomy anymore: tractors and tillage machineries ensure the top soil structure and seedbed preparation, fertilisers feed crops, pesticides manage weeds, diseases and pests. This type of farming, associated with specific cultivars, is very productive but strongly related to fossil fuels8 and has a strong negative effect on environment and biodiversity. If one basic element of those productive systems is removed, some problems could occur, such as lowering of the production level, weed and pest management difficulties… then farmers need to go back to agronomy to find a solution. That was happening when organic farmers decided to remove chemicals and industrial fertilisers: to succeed they needed to develop new rotations, use green manure, etc. It’s the same for farmers abandoning soil tillage: they are essentially confronted with weed infestation and have to find a solution. In a conventional way, they can decide to suppress weeds with chemicals tools (and today easily with GMO glyphosate resistant crops). In conventional systems, this solution leads to weed and pest resistances and farmers need to put more and more inputs in their system (chemicals, tillage, irrigation…), the costs are growing and systems are moving from economic and ecological sustainability. This can not be described as Conservation Agriculture but rather a case of no-tillage: chemistry replacing soil tillage. No tillage in France (BVA enquiry for TPT, 1999): There is a misunderstanding in Europe between shallow cultivation and no tillage or minimum tillage: even if a lot of farmers stop ploughing for some winter crops in their crop succession, soil tillage is already intensive with the repetition of shallow cultivation. Moreover, they do not grow efficient covercrops or use appropriate rotation. The real way to Conservation Agriculture is to replace soil tillage by agro-ecosystem management such as rotation and covercrop management. That is sustainable and profitable. In fact, the difference between conventional no tillage and Conservation Agriculture could be compared to the use of mouldboard plough: farmers use it in intensive systems and also in organic farming systems. No till is just a tool but a very powerful tool. However, the whole system (soil, ecosystem, farmer…) needs to progress at their own rhythm. Farmers who reduce soil tillage are discovering step by step their soils and ecosystems, with setbacks and successes, mastering techniques, developing covercrops and new rotations. This progressive improvement of their systems reduces gradually the necessity of tillage, chemicals or irrigation. No-tillage drives farmers to develop more their technical skills, acquire more agronomic and ecological knowledge and then to sustainability. Due to the global situation, we need to develop high efficiency farming systems. Today, farmers have technical, agronomic and ecological tools to solve their problems (such as machinery, plants, rotation management, chemicals…). However, the solution will not come with the development of a specific tool but with the capacity of each farmer to organise those tools to fit their own system. Conservation Agriculture seems to be a sustainable way to succeed, provided farmers have access to the information and the knowledge.